Hello people of the internet! Okay, I hate to admit it but I've failed Blogtober already. I had a busy weekend and on Sunday I was feeling a bit sorry for myself. Well... I was mildly hungover, haha! But, I'm back to it! And, today's post is a special one. 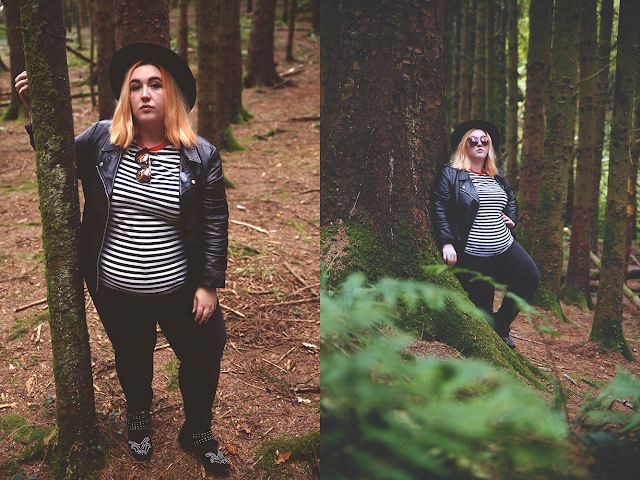 My lovely friend Ryan and I went to the forest by the house to get some next level OOTD pictures! Are you guys as obsessed as I am with these pictures!? Ryan is one of m best friends and he is one-half of Affinity Wedding Films Ireland. And, he's such a talented human! Check out their Instagram and Facebook while you're here! We've been talking about maybe doing more stuff like this in the future and I'm so excited. Part of me really wants to revamp my blog but part of me is still happy with exactly where it is now. I guess you guys will just have to wait and see! What's your current go-to outfit? I love the shot of the necklace! The hat and studded boots add an interesting edge to a casual outfit, you got a great thrifty find with that hat! Those pictures are so beautiful! I love the fall vibe and the way the striped shirt really pops out! You look fab, great outfit! Your photos are stunning! I love your studded boots and necklace!